The butterfly is a beautiful addition to your garden. Because they can be easily grown and observed, because they occur all across North America, and because they are so beautiful, they are well studied in homeschool. Here are some ideas for doing a unit on lepidoptera, butterflies. Start with a trip to your dictionary and look up the words: butterfly, lepidoptera, moth, scales, wings, proboscis, and antennae. Next, check out a book about butterflies and learn about their life cycles. Then, go to your garden shop and ask about plants which attract butterflies and about the gardens they love best. Now you are ready to put together your butterfly garden. There are a few qualities a garden should have in order to become a place which will attract butterflies. The location should be sunny and have some protection from the wind. Although butterflies look delicate, they are stronger than they appear, but wind will tend to carry them easily past the plants you want them to inhabit. They do bask in the sun on low walls, log piles, and stones, all places of shelter and sun. Butterflies have predators as well and low growing shrubs and rocks can provide some protection. Butterflies need sources of rich nectar and are attracted to plants which smell sweet. Choose plants like the butterfly bush or the coreopsis which will provide these things by growing beautiful flowers all season long. 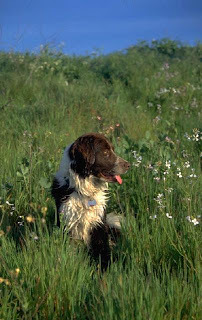 The most obvious plants are local wildflowers; for example, honeysuckles, lupines, black-eyed susans, and, in Texas, bluebonnets. See the list below the post for suggested plants. In your local area there may not be many of those plants listed here, but do not worry as there are some generic plants which will probably be found either in nearby fields or at your plant store. Other sources of butterfly attracting plants are mail order suppliers. Mass plantings of colorful and sweet smelling plants are great for your butterfly garden. Creeping phlox which cascades over walls is a good attractor as in Spanish heather. Another, often overlooked plant type which must be present in the garden is the edible plant; edible, that is, for the caterpillars. When you attract butterflies, they will lay eggs for the next generation of butterflies. When the eggs hatch, the larvae (caterpillars) must have food so you need to provide for them. Members of the carrot family, parsley family, lettuces, celery, and other herbs are feasts to caterpillar. Don’t begrudge them the food because they represent your next group of butterflies. Host plants will supply many needs of the butterfly in all of its life stages. Some of these are Butterfly Weed (providing for the Monarch butterfly among others), herbs like dill, parsley, and fennel (which the Black Swallowtail enjoys), and the Tulip Tree (a home for the Tiger Swallowtail). Willow, clover, milkweed, sassafras, Queen Anne’s Lace, and passion flower are other host plants. Remember, too, that butterflies are insects and because of this are sensitive to insecticides and pesticides which you may be tempted to use in the garden. If you need to use something to save your fruit trees or whatever, try to limit the area it may affect. Only spray the effected area as overspray will kill your butterflies. According to the Wise Garden Encyclopedia, even herbicides and fungicides will harm the insects you want to cultivate. So, now you have a garden which has attracted many different kinds of butterflies. What do you do next? Everything is not known about butterflies, their habits, their cycles. This means that you may discover something important about butterflies. So, keep a journal on what you see in your garden. Record the numbers and varieties of the species you see. Try to answer the questions: what, where, why, when, how, how many, and for how long, in your journal and as completely as you can. Make colored drawings for your notebook. Study the behavior of the butterfly. 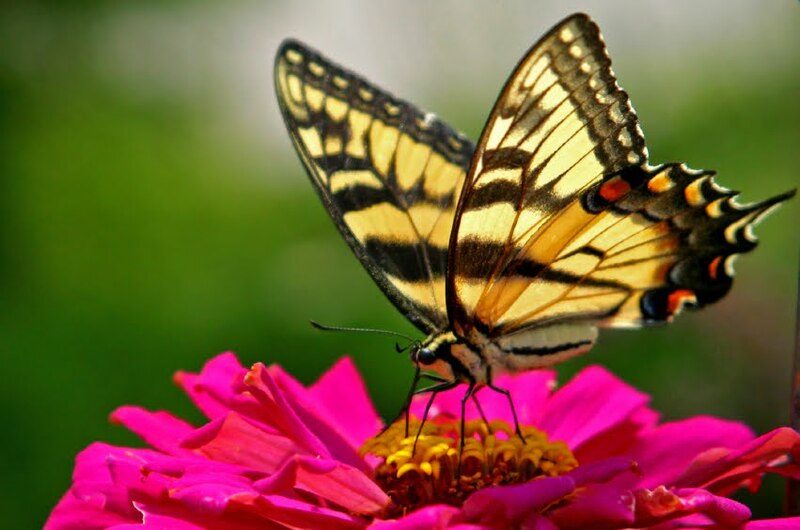 What are the favorite flowers to which each type of butterfly you see is most attracted? Do they seem to migrate from yard to yard, or even farther? How long do you notice one butterfly in your yard? Study the biology of the butterfly: What are the butterflies’ sizes, colors, and flying characteristics? How do they see and smell? Can they recognize the colors of the flowers or it is only smell which attracts them? What are the life cycle stages of your butterflies? Study the adults and try to find the eggs they lay. Keep careful watch over the eggs until they hatch, then observe the larvae. Make sure that the larvae are getting plenty to eat and then watch over the chrysalises they produce. At the correct time, perhaps ten days, the beautiful butterfly will come out of the chrysalis and begin to fly. Keep records of the stages and the number of days each lasts in your journal. Collect more butterflies for your garden: Go out into the field or forest and look for chrysalises hanging from limbs, leaves or rocks. Collect them carefully and place them into a vivarium (a place for live specimen). Later, when they come out you can place them in your garden on some good tasting (to larvae) plants for them to grow and mature. Another way to collect butterflies for your garden is to look for caterpillars to place on the parsley or carrot plants. Although some of them are not the prettiest thing in the garden, they mature into something of beauty, so remember that when you see them eating up your salad greens. Observe the four stages of the life cycle: egg, larva (caterpillar), pupa (within the chrysalis), and adult (butterfly). Make drawings or take photos to record the events. To photograph a butterfly, you will find it best if you collect the caterpillar and wait it out until the adult emerges from the chrysalis. For a brief time, the tissues have not hardened sufficiently for flight and the butterfly can be photographed fairly easily. The butterfly is an insect and so is made up of three body parts: the head, the thorax and the abdomen. The parts are segmented with the wigs usually coming from second and third segments of the thorax. The head has compound eyes, segmented antennas, and a proboscis. This proboscis can unroll into a long sucking tube which allows the butterfly to feed upon nectar. If you wish to preserve some of the butterflies, catch them with a butterfly net, place them in a killing jar, dry them on a spreading board and pin them, labeled, in a box prepared for the collection. Be sure to write on a slip of paper pinned with the specimen, the pertinent data: place found, name of the butterfly species, common name, when the specimen was collected, and by whom. The homeschooler has an advantage in the study of butterflies since they are usually active during the day. There are many types of butterflies, over 700 varieties in North America, so there are plenty to study. Build a butterfly garden, get out that journal, and begin a study of beautiful creatures which can last a lifetime! This list has been adapted from The Pike Gardening flyer on Butterfly Gardens and The Wise Garden Enclyclopedia. The Wise Garden Encyclopedia by HarperCollins Publishers. An alphabetic resource for anything to do with gardens, plants, and planting. The authors have included hints for growing and other tidbits of useful information hidden within the formality of a glossary format. Butterflies and Moths: A Golden Guide This book is a must have for the homeschooler who is interested in butterflies. Discussing the life cycles, habitats, migrations, and food sources, the book provides a fairly complete text. The majority of the book is, of course, identification of American butterflies and moth in full color. Butterflies Worth Knowing by Dr. Clarence M. Weed. A wonderful introduction tobutterflies covering their cycles, habitats, structure, and going into much detail about some of the more common butterflies of North America. It is an older book which can be found in libraries. Botany by Kim Wright A brand new unit study written for homeschoolers but which could be used by any school, this 133 page book has lots of activities and lists of resources and other ideas to use in a study of plants. (even has flashcards) There are questions to answer in the study, instructions for an organised plan, vocabulary list, and lab instructions; basically everything you need but the text, two lab books, and a few materials, to do a semester on plants. Throw out the biology book for a semester and use this unit study on plants. The Butterfly Site Visit this website to plan your butterfly garden by area, and then order the appropriate plants or seeds. Lots of good tips on butterfly gardening! Insect Collector’s Backpack Kit. This great little backpack comes with everything you need to collect butterflies or any insect. Sold by Home Science Tools, it has a net, Audubon guide, magnifier, killing jar, pins, and a bunch more. Check here for all their insect collecting supplies. Build a unit study on a science topic! It is easy to do and fun to plan. Follow these instructions for a unit on dinosaurs or on any other topic you would like to study. This article will tell you how to go about designing a science unit for your homeschool, or how to turn your literature based unit into one based on science. First, you will need a topic and a goal. As an example, we will use dinosaurs as a topic and the goal will be the construction of a Dinosaur Notebook. Because we want this to be a learning experience, as well as a fun unit, we will choose some science skills to go over during the unit: drawing maps, making scientific drawings, and analysis. When you choose a set of science skills, you should choose about three for the unit. Remember you don’t need to cover all the skills in one unit. For ideas about science skills, see the sidebar. Some parents may wish the students to write a research paper about some aspect of the topic and if so, plan to spend several extra hours on research. Begin your research with a trip to the library or to the internet for one or two foundational resources about the topic. 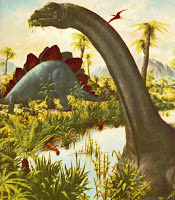 For dinosaurs, I would choose a book like The Dinosaur Encyclopedia by Dr. Benton. In this single source, you have a summary of everything from the definition of dinosaurs, to more specific information on the kinds, types, habitats, and habits of dinosaurs, giving us a running start. If you come home from the library with 25 books (or more) about dinosaurs, you will quickly be overwhelmed by the volume as well as by the repetition of the information. By using a summary book you will be able to plan easily for the unit. Planning for the unit study means considering several things: vocabulary, major sub-themes, and projects or activities. The vocabulary of a new topics is probably the first, most important thing to cover because knowledge of the vocabulary is the key to learning a new topic. Of course, there are always many new words in a new topic, so it is a good idea to limit your vocabulary list to about 40-50 words. If your child is writing or typing well, you should have him look up the words and write down the definitions in the first section of his Dinosaur Notebook. He can do this while reading the reference book on dinosaurs. This reading and vocabulary activity can be done first, even without another trip to the library. The major advantage to doing the reading first is that you and your student learn about some of the more interesting aspects of dinosaurs. These will be the sub-topics which you will use for the next step in planning. You may choose about 5 major themes within the area of dinosaurs (or your own topic). They can be about any aspect of the topic, for example, a student may be interested in duckbilled dinosaurs, foot prints, dinosaur anatomy, dinosaur habitats, and whether or not men saw dinosaurs. Each one of these sub-topics is a study in itself, but each will also be mentioned in the general book of dinosaurs you already have read. So, you will list the sub-topics and make a divider for each one. In the sections, the student will write down information he already knows about this sub-topic. If possible, a drawing is good. For example, under dinosaur anatomy, your student might make a scientific drawing of each of the two types of dinosaurs: the bird-hipped and the lizard-hipped, the two major classifications of dinosaurs. The reptiles are named according to the structure of the hip bones. Note: little knowledge exists of the internal anatomy of the dinosaurs because the evidence we see is mostly skeletal. You can see how a drawing will show the two types better than a written description. Other anatomy activities might be to create a clay model, build a plastic model, draw up a classification chart of dinosaurs, or make your own classification of dinosaurs based upon the illustrations in your book. in each sub-topic, you will write, report, illustrate, or type the major concepts in a summary fashion. Later on, you will return to the library for more information, more books, and more resources. Using the new more detailed resources, you will elaborate on the information already in your notebook. This distinction is important. Start out with few, but general ( not necessarily easy) references, then as the student assimilates the information in the first books, he will be better able to choose follow-on references. He will also know more about what he is interested in and this will aid his next choices. By starting out with a general reference, you will also be better able to eliminate certain books because they offer no new information. By doing this, you will end up checking out fewer, better resources. You have some goals for each major sub-topic: define, explain, elaborate, and experiment. The goal for vocabulary is complete when you have listed and defined the major terms which are keys to the sub-topic. (There are always more words to learn, so you should limit the list.) The student should explain the idea(s) behind the sub-theme. This might take a paragraph or two from a younger child, and more from an older one. In the sub-topic of anatomy, the student should know that bone structure is the key to identification of the dinosaurs and should be able to explain how. In the sub-topic of habitat, the student should be able to describe the environment or a model of a habitat the dinosaurs lived in. He may wish to create a diorama, a painting, a mural or a model of a habitat. See the list of resources for a set of paper dinosaurs and background. The student should be interested in each sub-topic (since he choose each sub-topic). He should be allowed to read freely on the topic, doing activities as desired. He should be encouraged to talk about them, too, as that is how a child shows and builds his interests. If you are trying to also teach some organization skills, then I suggest that you keep him on the already planned sub-topics for a specific time or for a specific activity before allowing him to move on to a new area. Always remember that too much regimentation stifles curiosity and interest. One of the benefits to using units is that the student can learn freely and not according to someone else’s plan. Elaboration means putting in the details. The elaboration of a topic is best done through the use of activities of every sort: drawings, maps, collections, etc. This is the time to go back to the library for more materials. This time you may be looking for details instead of the big picture as before. Now, your student can draw maps showing where the duckbills lived or at least where they have been found. If you live in an area where dinosaur fossils have been found, you may enjoy looking for some yourself. The Golden Book of Fossils is a good resource and includes details about how to start and maintain a fossil collection. It is in this elaboration step that the student really becomes an “expert” in the area. When a child finds a topic he is very curious about, you should encourage him to investigate that topic even if it means taking some time away from a more traditional subject. It may also mean scheduling time for individual research if your days seem to fill up quickly. In science, experimentation is important. Not all subjects are conducive to experimentation, but there are usually some things you can do along this line. When studying dinosaurs, a student might make casts of animal footprints in plaster. (or human) You might study ways to preserve bones (like petrification) or weather patterns, or meteor strikes. So, while we cannot study and experiment upon dinosaurs directly, we can do some work on secondary topics. If you have chosen a topic like butterflies or oceans, there are many experiments you can do. Search for some of these in books like Janice Van Cleave’s Earth Science for Kids. You might also try some of the back issues of Homeschooling Today for some great ideas for experiments in many topics. The last section of your Dinosaur Notebook will be the resources and references you have used. This is important especially if you ever intend to return to this topic. You might consider making it an annotated list and make little notes about each resource and how you used it. If you follow this method of planning a science unit study you will create a truly scientific study, individualized for your own child, and based upon the actual topic, not on literature. Note: Although, you may wish to have your child read some good literature on the topic to round out the science unit. By using this method you will also be in control of your library books and not be overwhelmed by the huge number of resources available. You will plan your study based upon a goal, a general reference, a vocabulary list using only 50 words or less, and a few specific resources. Your student will define, explain, elaborate, and experiment in his own areas of interest. The Dinosaur Encyclopedia by Dr. Michael Benton. A good general book on dinosaurs and an excellent book to begin your studies on these reptiles. It includes a discussion of dinosaur, types, and classification of dinosaurs. The geologic eras of dinosaurs are explained and the habitats they lived in. Evolution is assumed to be true but this brief part can be easily skipped or adapted. There is a long section on the different kinds of dinosaurs, including their sizes, habitats, classifications and foods. After the story of early dinosaur finds, the author gives directions for hunting for your own dinosaur fossils. There is a glossary and an index, both evidence of a general resource book. Aladdin Paperbacks (Simon and Schuster), 1230 Avenue of the Americas, New York, NY 10020.